There was one hell of a snowstorm in Northern Italy Saturday, and rescue operations are undergoing at Turin’s Stadio Olimpico. It seems that many Reggina players are still buried under the snow, something which down in Calabria they evidently don’t get to see a lot of. The same cannot be said for Juventus, who welcomed the powdery weather with open arms and proceeded to put an avalanche of goals past their Amaranto opponents. The match was also particularly sweet for Alessandro Del Piero, who thanks to his 72nd minute penalty-kick achieved a total of 250 goals with Juventus. An historic milestone for the Bianconeri captain, and a great night for Juventus who after their 1-0 loss to Inter last week-end, get right back on track for the Scudetto race. Tactically, there weren’t many surprises in Juve’s formation. Mauro Camoranesi was finally back to full fitness, Pavel Nedved confirmed on the left wing, while Claudio Marchisio occupied the center-midfield position in lieu of Tiago (injured). On the other end, Reggina coach Nevio Orlandi dug out the trenchlines with a very defensive formation: Tommaso Barillà and Pablo Alvarez‘s movements down the wings were restrained, while Franco Brienza and Francesco Cozza relied on counter-attacks to get playable passes. Six-goal topscorer Bernardp Corradi was left on the bench. The real winner of the night, regardless of the final result, was the weather. 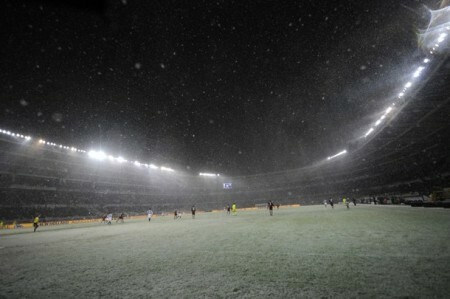 It was cold, very cold in Turin… and it was snowing, something which hadn’t even taken place during the mid-week Champions League action (in St. Petersburg of all places)! Thus, the match struggled to take off. When it did, it was all Juve’s. Chiellini‘s headed attempt from a corner-kick was wide, a powerful long-range free-kick from Del Piero was kept out by Campagnolo. A goal was in the icy air of the Stadio Olimpico, and it promptly arrived courtesy of Mauro Camoranesi. The Italo-Argentine winger received Nedved’s assist from the left (after a lovely Del Piero back-heel pass) and slammed the ball below the crossbar. 1-0 Juventus, with Camoranesi scoring despite having hurt his shoulder in the sixth minute of play (Marchionni was ready to come on, but the player insisted he be allowed to remain on the field). Shortly after Juve made it 2-0 through Amauri, who got his 7th goal in the Serie A by forcing his way through a goalmouth scramble and scoring from close range. Previously, Nedved had gone close to getting one himself, exploiting a great Del Piero fake to let the ball through; Campagnolo did well to save the Czech’s effort. And Reggina in all this? Lost like a ship lost in the fog, or in this case like a skier in a snowstorm. And a skier should know that hitting the gates of the slope (like Santos’s crossbar in minute 33, with Manninger beaten) doesn’t help you get to the finish line in one piece. The 2-0 Juve half-time scoreline was no surprise to anyone. The match was effectively over, yet there was still time for Juve to complete their night of celebrations. Giorgio Chiellini’s header (receiving a Marchionni set-pieces cross) provided the 3-0 goal, the icing on the cake of a wonderful start the season for the Italian center-back. Then Brienza‘s free-kick seemed to get one back for Reggina, but the referee disallowed the goal because the kick had been taken too soon. Brienza’s second effort was just a little too high. Minor details in the grand scheme of things. The moment all home fans were waiting for arrived in minute 69, when Sebastian Giovinco (on for Marchisio) won a penalty-kick and Alessandro Del Piero stepped up to complete the picture. From spot ADP scored goal nº250 for Juventus, and put the finishing touch on the 4-0 full-time scoreline. “I’m happy if I play well, even more if I score. Records that come with a victory make me even happier. I hope they are linked to important objectives.” said Del Piero. We hope so too. GOALSCORERS: 28’ Camoranesi (J), 44’ Amauri (J), 62’ Chiellini (J), 74’ pen. Del Piero (J). JUVENTUS (4-4-2): Manninger – Grygera, Legrottaglie, Chiellini, Molinaro – Camoranesi (46’ Marchionni), Sissoko, Marchisio (70’ Giovinco), Nedved – Amauri (76’ Iaquinta), Del Piero. (bench: Chimenti, Mellberg, De Ceglie, Ekdal). Coach: Ranieri. REGGINA (4-4-2): Campagnolo – Cirillo, Valdez, Santos, Costa – Alvarez (50’ Corradi), Barreto, Carmona (57’ Tognozzi), Barillà – Brienza, Cozza (82’ Di Gennaro). (bench: Marino, Cosenza, Sestu, Ceravolo). Coach: Orlandi. 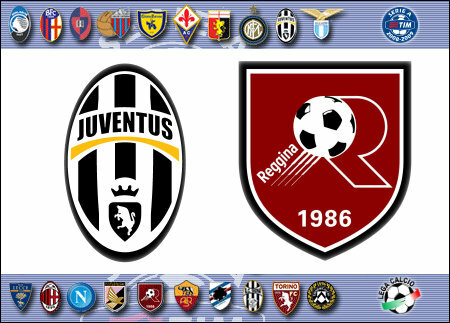 This entry was posted on Sunday, November 30th, 2008 at 3:24 pm	and is filed under Juventus, Reggina, Serie A. You can follow any responses to this entry through the RSS 2.0 feed. Both comments and pings are currently closed. It snowed in MTL today Kev.